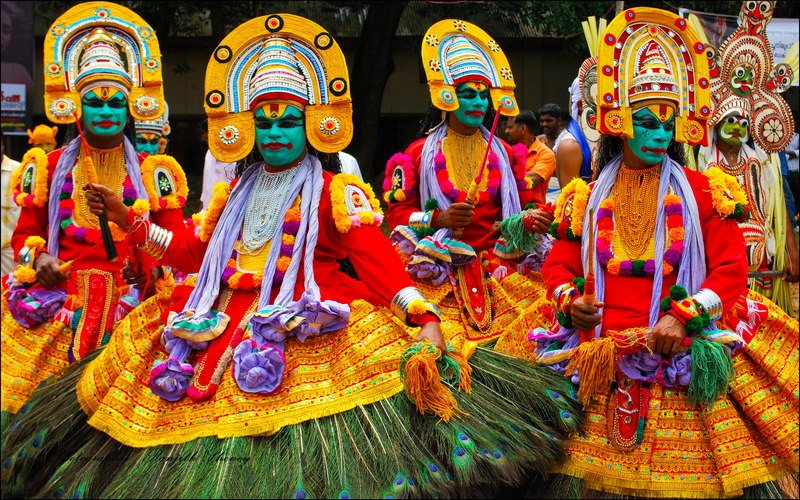 Onam Kerala, India’s ten-day harvest festival marks the homecoming of King Mahabali, a mythical figure. Rich in culture and heritage, the festival is celebrated at the beginning of the Chingam month, which is the first month of the Malayalam Calendar, also known as Kollavarsham. The most important day of Onam is the Thiru Onam. Celebrated in Kerala of Southern India, Onam Kerala is known as the biggest and most respected festival of the year. The more spectacular celebrations will be held at places like Trivandrum, Kochi, Kottayam and Thrissur. Meanwhile, Tourism Week in Kerala is also celebrated by the state government during the festival and the culture of Kerala would also be portrayed during the celebration. The Vamanamoorthy Temple in Thrikkakara Temple, which is located approximately 15 kilometers northeast of Ernakulam is largely associated with the Onam festival celebration. The temple was built to be dedicated to Lord Vamana, who is the fifth incarnation of Lord Vishnu. On Atham, which is 10 days before Thiru Onam, a special flag-hoisting ceremony would be held for 10 days with music, dance and cultural performances and the main highlight would be the grand procession of the pakalpooram, which will be held a day before Thiru Onam. The main deity, Lord Vamana would also be carried on an elephant and paraded around the temple grounds while being followed by a group of elephants decked out in richly decorative coverings. The idol figure of Lord Vamana would also be decorated in the form of one of the 10 avatars of Lord Vishnu daily during the 10 days of the festival. The Athachamayam festival held at Tripunithura also celebrates the Onam festival on Atham. It was said that the Maharaja of Kochi used to march from Tripunithura to Thrikkakara Temple thus leading to this modern-day festival which features a street parade march filled with musicians, different art forms of traditional Kerala, beautifully decorated floats and elephants heading to the temple. Rituals are performed during Atham and people would take early baths and perform their prayers. 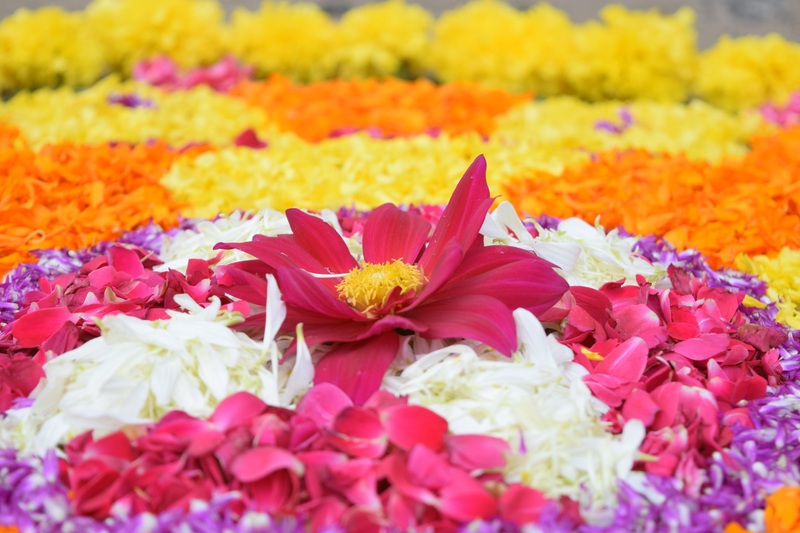 The ground in front of houses would be strikingly and beautifully decorated with flowers arranged in beautiful patterns called pookalam to welcome King Mahabali. The decorations would be left for ten days. During that period, pookalam competitions are held by various organizations. People celebrate the Onam by getting new clothes, hosting and participating in games, sports, snake boat races and dancing. The people also love to cook a lot during Onam and the highlight is a grand feast called Onasadya served on Thiru Onam, which is an elaborate meal on banana leaves made of several varieties such as curries, upperies (deep fried dishes), pappadams (crispy wafers made from chickpea, lentil or rice flour), uppilittathu (various pickles), chammanthi (chutney), various puddings and even fruits and digestives. On the other hand, Onasadya is served daily at Thrikkakara Temple and the feast is attended by thousands of people during Thiru Onam.